Opera wants Beta testers to concentrate on testing Off-road mode, so it’s enabled by default in this version. I switched freely between the two modes and didn’t see any differences in rendering and performance between them. So it seems we are getting reduced data use “for free” with no loss in functionality. I tested the new Opera Browser Beta on my somewhat dated Motorola Photon 4G, which although it has a dual core processor and 1 GB of RAM, is stuck on Gingerbread due a lack of display and camera drivers compatible with current Android kernels. The Opera Beta ran quite well on the Photon except for an annoying and unexpected bug. For some reason the Opera Browser displayed all text on every page using a serif font (image below, left), completely ignoring the font-families specified by the page’s designers. The font issue seems to be specific to either the Photon or Gingerbread as it didn’t occur on my wife’s Nexus S running Jellybean. Except for the ugly font issue, Opera worked pretty well on the Photon with accurate rendering, mostly good usability and smooth scrolling, although the browser did sometimes freeze for several seconds while loading large pages. On the Nexus, which has a single core processor and only 512 MB of RAM, performance was a bit degraded compared to Opera Mobile Classic or the Android browser. Opera Beta performed much like the Chrome browser on the same phone. It was usable but scrolling wasn’t particularly fluid and moving between fields on some web forms caused the browser to freeze momentarily. On the more powerful Photon, the browser was usable on every site I tried except Quartz’s qz.com responsive site which is kind of an acid test for mobile browsers. 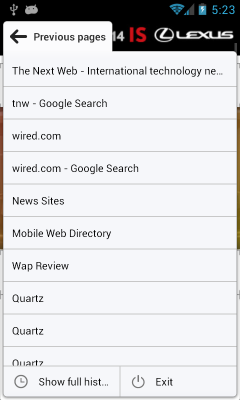 The only browsers I’ve used that Quartz works properly in are iOS Safari and Firefox Mobile. Not surprisingly, the Opera Browser Beta struggled with Quartz, frequently displaying blank pages and freezing when I tried to scroll. 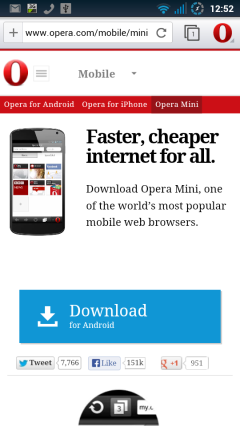 The latest Opera Browser was stable on both devices. In my testing I used the Beta for about 5 hours over several days. 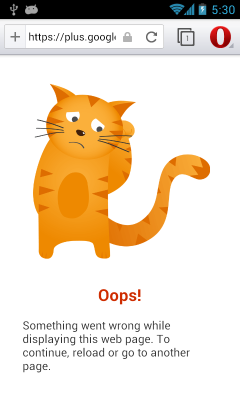 The browser never crashed or force closed but a couple of times it encountered an error and displayed a sad cat graphic. In both cases I was able to recover by refreshing the page. Overall I’d rate the latest Opera Browser Beta a worthwhile upgrade from previous versions. Stability is improved and the new Off-road works properly with many more sites, although it doesn’t seem to be as good at reducing data consumption as the old Opera Mini based one. Over the course of my testing Off-road mode reported that it had reduced data traffic by 60%. The old Opera Mini based Off-road mode typically achieved better than 80% data savings. In spite of the improvements I’m not ready to make the Opera Browser my daily driver for for a couple of reasons. The font problem is an obvious show stopper but it it doesn’t effect the majority of devices, just mine. 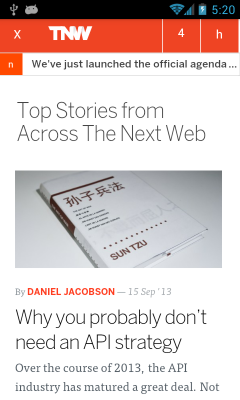 A bigger problem that effects everyone is Opera’s lack of proper bookmark management. It’s possible to bookmark the page that you are viewing but there’s no way to edit bookmarks and that means no bookmarklets. I can’t live with a browser that doesn’t support bookmarklets, which I use multiple times every day for things like saving interesting content on pinboad.in, sharing it on social media, translating pages with Google translate, viewing a page’s http headers or its Google Page Rank or a host’s whois information or fixing a page’s with unreadably low contrast text. You can partially work around the lack of bookmarklet support by installing a bunch of apps, but that adds unnecessary bloat to your device to support something that every other Android browser supports out of the box. 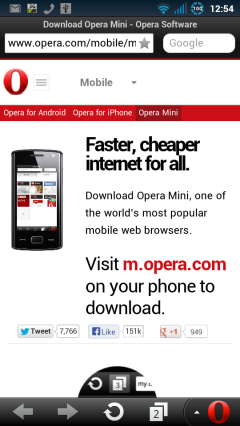 Opera Browser Beta 16 for Android is available in the Play Store for most devices running Android 2.3 or latter. This entry was posted in Browsers and tagged Android, Opera Browser, Webkit by Dennis Bournique. Bookmark the permalink. Still no Sync. Very annoying. The lack of bookmarks doesn’t affect me or any person I know, just so you know it doesn’t “affect everyone”. Speed Dial has been enough. As for the font bug I hope you used Opera’s bug report wizard to let them know. Thanks, I’m OK with Speed Dials instead of bookmarks. Opera just needs to make the Speed Dial’s target URLs editable so they can be used to store bookmarklets. As it is now there’s no way to save bookmarklets which effects every one who uses bookmarklets. I’ve filed two bug reports on the font issue. One when the first Opera Browser Beta came out several months ago (the bug has been in every Opera Browser for Android Beta and Release version). I filed another bug report yesterday.